I have several sets of these coordinating same colour family sets of decorative papers and have been wanting to use them for a while. I have decided to give it a go and see what I can produce with them this year. There are 10 sheets in this set - mostly florals but a couple with plaid and more soft designs. I took a sheet that had several floral motifs and cut them from the background to use as the focal elements for this set of cards. I made these two for my January card exchange and the others will show up over time. They make very monochromatic cards and therefore have a certain appeal because of that. After cutting out all the motifs I layered them onto coordinating cardstock. For the left hand card I used one of the smaller ones. I used one of the other all over floral sheets for the background over a coordinating card front and added a rose organza ribbon on the right hand side. I mounted the focal element at the top over the ribbon using 3D foam tape. Next, I created my greeting using an eyelet frame die cut (SX) over a laser printed greeting (Bird's cards) punched with a large oval punch (SU). There is very little overlap so I used regular tape to bind the two. I used double sided tape on the top where it overlaps the focal element and 3D foam tape on the bottom where it overlaps the ribbon. To finish off my card I tied a short piece of ribbon to the bit of ribbon you could see at the bottom of the card to simulate a bow. 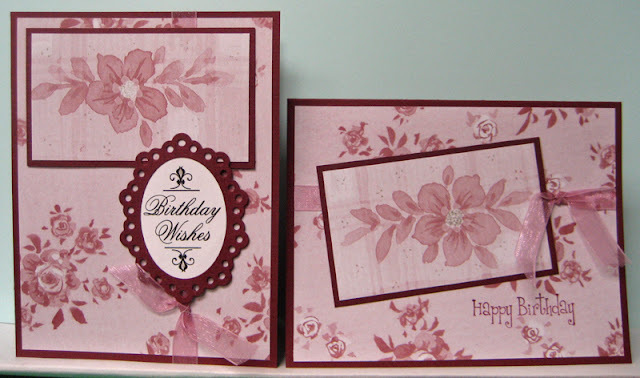 For the right hand card, I used the same floral paper for the background over a coordinating card and added the same pink organza ribbon gluing the ends to the back of the decorative paper. 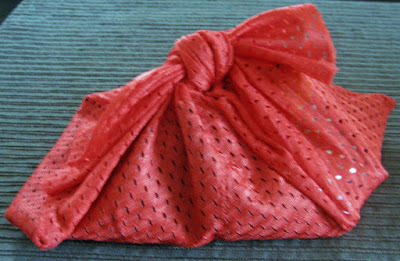 Next, I adhered my layered floral element using 3D foam tape over the ribbon. I stamped the little birthday greeting onto the background paper and embossed it with clear embossing powder.